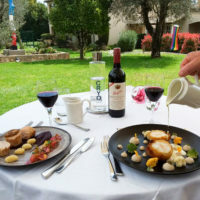 The 4-star Hotel de Mougins, a member of the Maranatha group since 2015, is an oasis of quietude and elegance renowned for its gastronomic restaurant Le Jardin (The Garden). 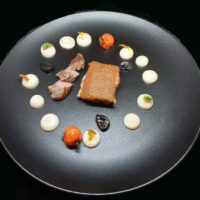 At the “piano”, the talented chef Basile Arnaud, offers on his menu a symphony of authentic and very natural flavors. 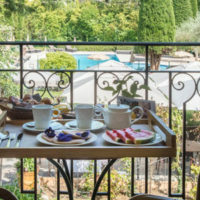 The Hotel de Mougins park spreads around a sublime 18th-century country house, at the foot of the medieval village of Mougins, a few minutes from the beaches of the Mediterranean, Cannes – capital of Cinema – and Grasse – Capital of Perfumes. 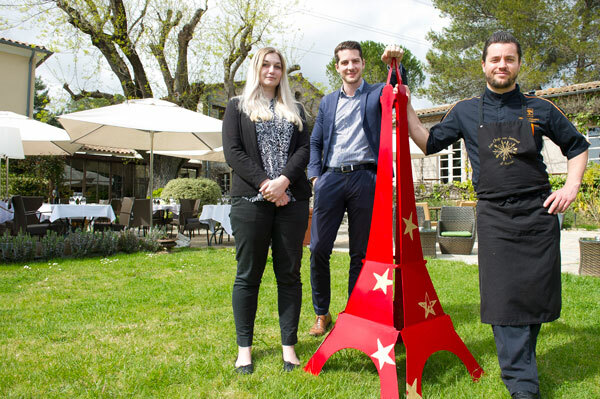 The village of Mougins, renowned for its cultural and artistic heritage, has become the Capital of Gastronomy thanks to Les Étoiles de Mougins (Stars of Mougins) which brings together hundreds of international chefs every year. 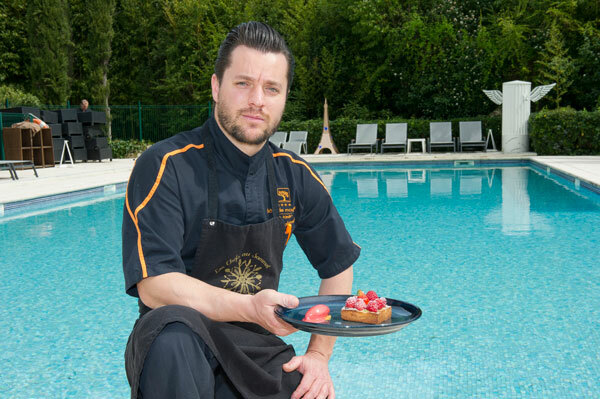 Basile Arnaud, chef of Le Jardin restaurant, is one of the generous chefs who enliven the International Gastronomy Festival with his talent. 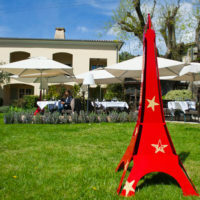 The authentic charm of this old bastide is enhanced by the turquoise waters of the pool which brings vivacity and tonus to the hotel vast and bucolic gardens. 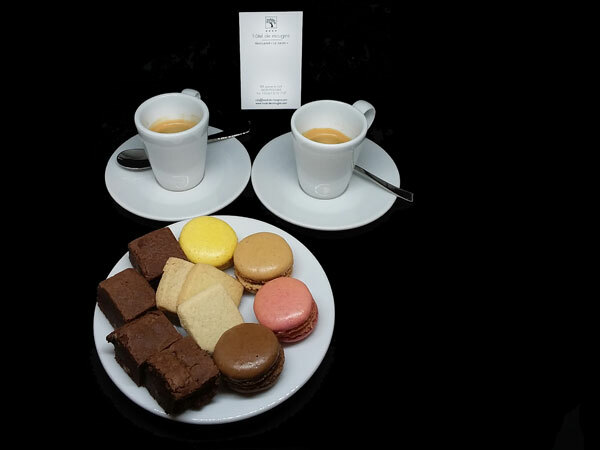 This heavenly place is welcoming its guests in a friendly and warm atmosphere. 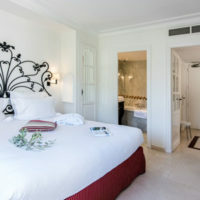 Its luxurious features, its attentive and discreet service are the signature of the Hotel de Mougins. 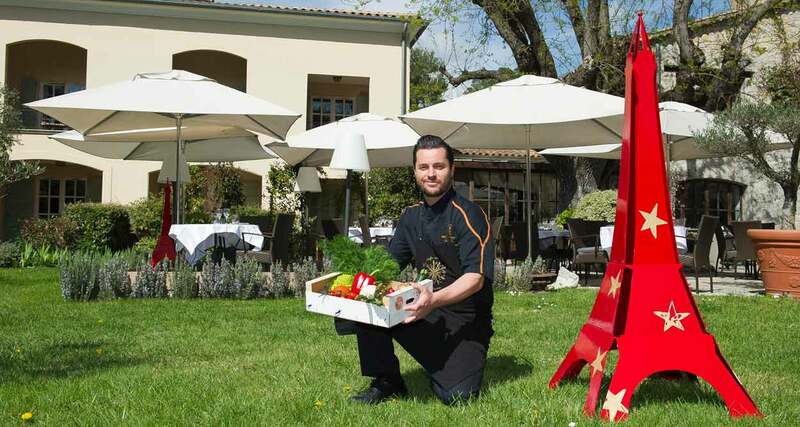 This small green paradise is also home to a gastronomic jewel: Le Jardin. 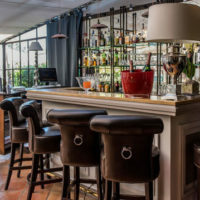 Inside, the elegant and spacious dining room opens onto an art deco style wrought iron glass roof. 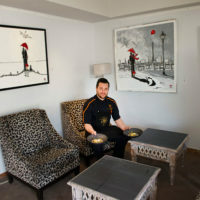 At fine weather, on the sumptuous stone terrace lulled by the song of the cicadas, art lovers can admire, in the shade of a sumptuous centenary ash tree, the works of artists who dot the lawns or sip a homemade cocktail, comfortably seated in black rattan armchairs. 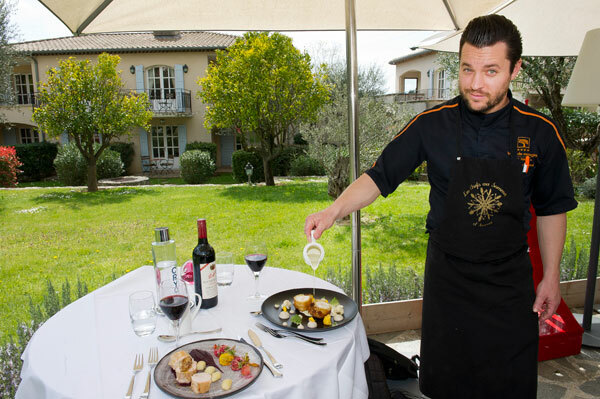 As for epicureans, they will experience unforgettable gastronomic and oenological moments, in tune with this magical setting. 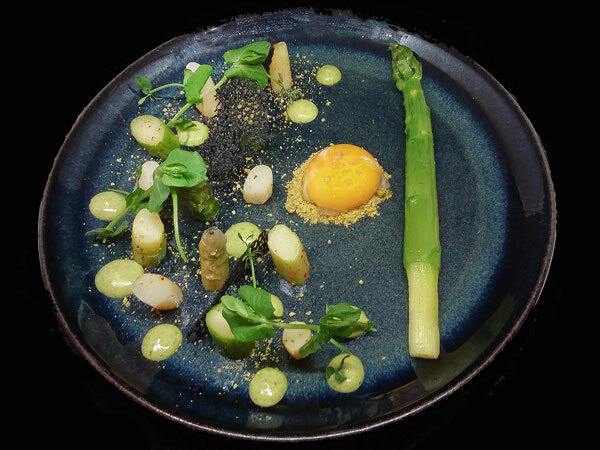 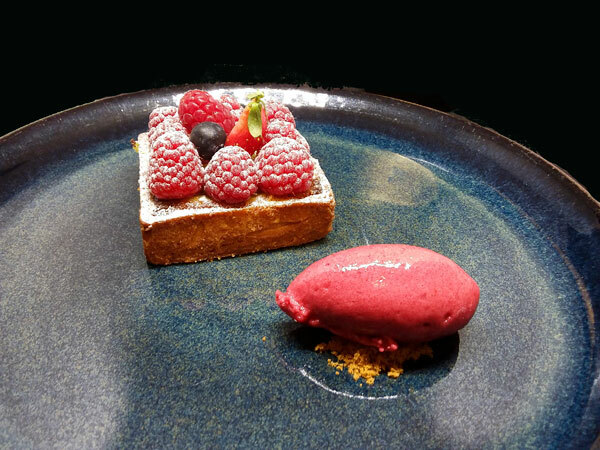 Le Jardin’s menu, created by the young and talented chef Basile Arnaud, offers in a few pages an absolutely amazing cooking, 100% homemade, fresh and refined recital. 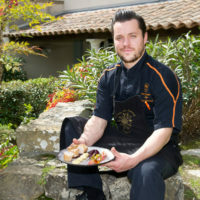 Rooted in his terroir and locavore, Basile Arnaud is also a chef open to influences. 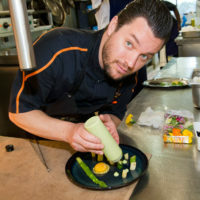 This passionate traveler has brought back in his suitcase a lot of flavors that come to enrich his “cuisine de terroir” with a touch of exotic perfume. 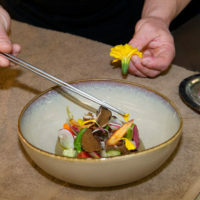 The many varieties of fresh market vegetables and aromatic herbs that make up his daily basket, make up a palette of enchanting flavors and scents in harmony with his generous, colorful and fresh plates. 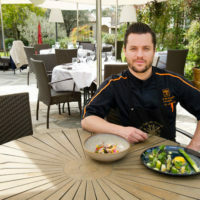 The chef also draws his inspiration from the terroir that irrigates his sea and land cuisine, and his cleverly revisited dishes are an ode to “bien manger”. 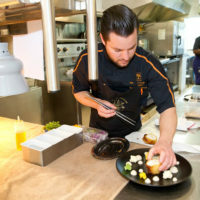 The passionate chef likes to feel the product to accurately reflect all its flavors without jostling it. 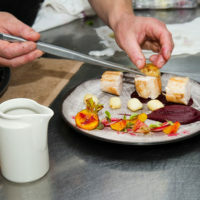 Fresh products carefully selected over the seasons, perfectly mastered cooking, precise seasoning, well-respected harmonies of tastes, are at the service of perfect combinations of land and sea. 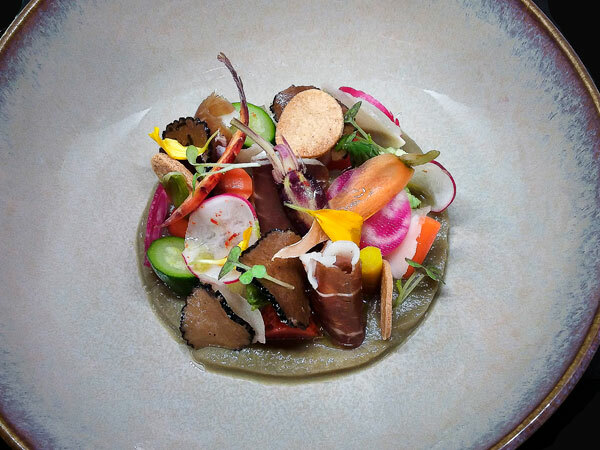 The iodized riches of the Mediterranean sea he loves to cook, is exalted with precision and lightness. 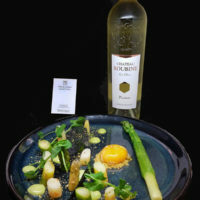 Basile Arnaud’s rigor in the development of his dishes, his elegant dressings, his creativity and the exotic notes gleaned from his travels, harmoniously sublimate his dishes in “sure values” for the finest palates. 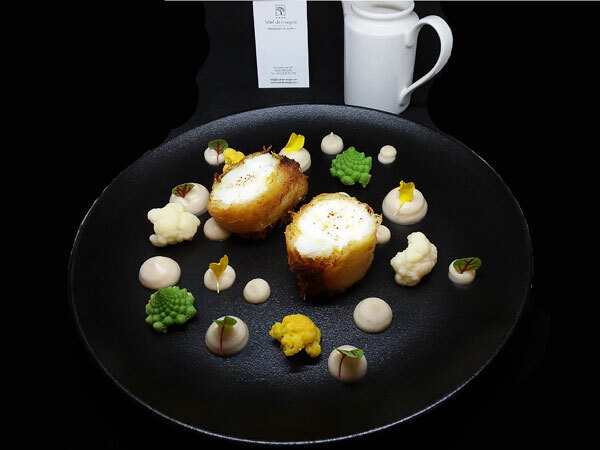 At the restaurant Le Jardin, Basil masterfully deploys his art through local cuisine, tinged with a touch of exoticism, enriched by his experiences with the greatest and his travels around the world. 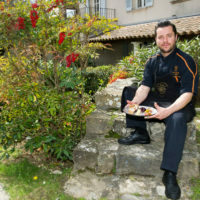 Basile Arnaud’s cuisine is paying tribute to the Mediterranean, its products and its producers. 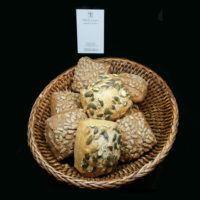 The fruits and vegetables he likes come from Fred Fantino (Producteurs Réunis in Nice), the products from the sea from the Pêcherie Azuréenne, the pastries from David Piron in Mouans Sartoux, the bread from the bakery Coup de Pâte. 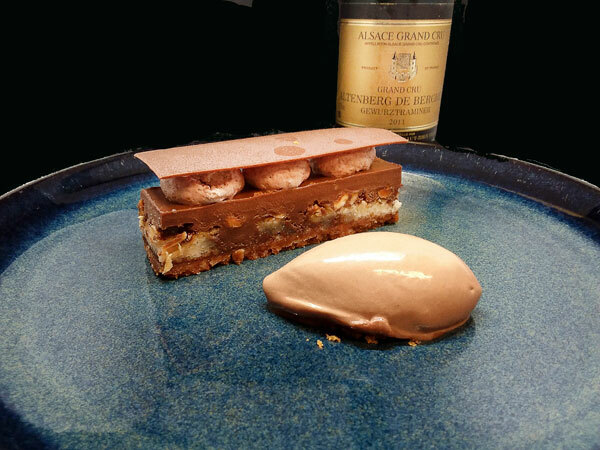 His sober and refined creations, oscillating between tradition and modernity, revisit with genius some traditional recipes according to his moods and his inspirations. 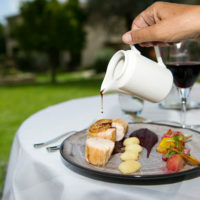 The menu at Le Jardin offers a wide gastronomic range. 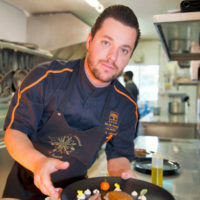 At lunch, the chef offers a bistronomic cuisine that changes every week and in the evening, a gastronomic cuisine composed with noble products such as blue lobster, worked around Moroccan flavors. 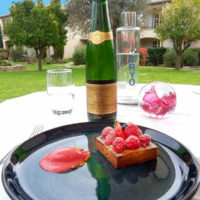 The meny is short and includes several formulas: starter or dessert alone (20 euros), dish (35 euros), starter – main course or main course – dessert (49 euros), starter – main course and dessert (55 euros). 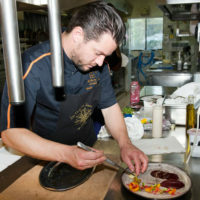 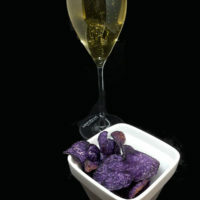 In the evening, a gastronomic menu is offered at 75 euros (excluding drinks). 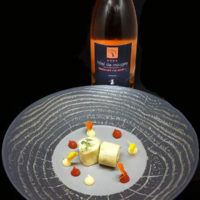 For food and wine pairings, the restaurant Le Jardin is seducing the most demanding palates with a rich and eclectic menu. 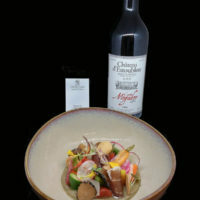 The Bordeaux are side by side with wines from the Loire Valley and Burgundy, but also wines from elsewhere. 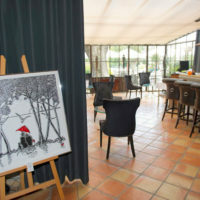 Le Jardin’s cellar also honors the beautiful terroirs of Provence by offering some confidential labels to be tasted without moderation. 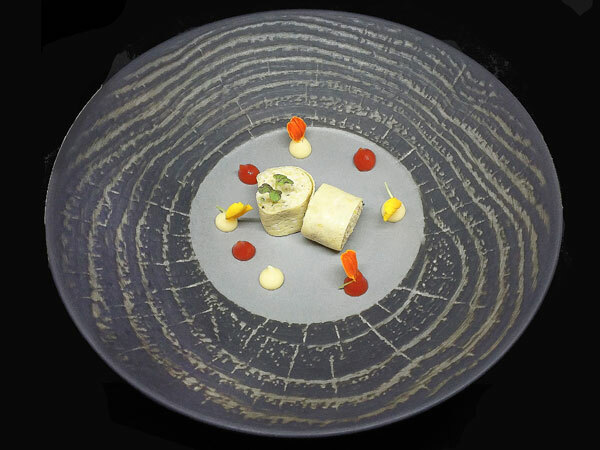 Oeuf Mimosa revisited, Egg White Crêpe: a touch of truffle gives all its dimension to this tasty original dish, which takes the rolled form of a maki. 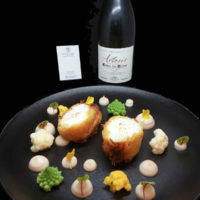 Lotte with Kadaif Curry, Cauliflower Mousseline with Hazelnut: coated with curry and honey, the burbot is dressed with angel hair and macerated in egg yolks. 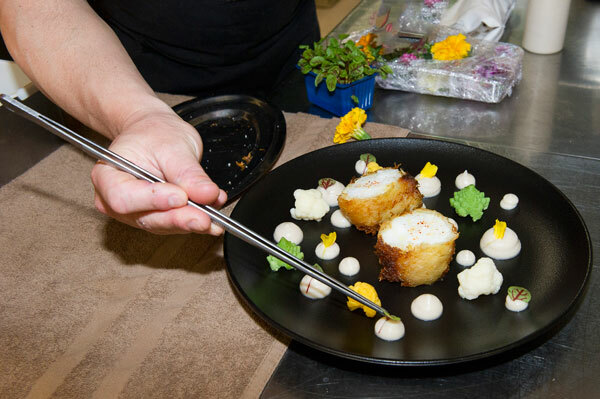 As an accompaniment: cauliflower purée with hazelnut and green romanesco cauliflower, yellow and white cauliflower, drizzled with a ginger, coconut and lemongrass sauce, flavored with a hint of raz el hanout. 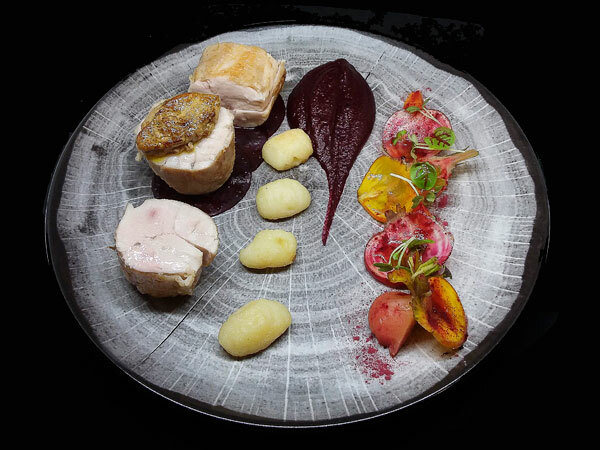 Poultry Supreme with Black Pepper from Madacascar and Foie Gras, declination around the Beetroot: a tasty poultry with pan-fried gnocchi, accompanied by a carpaccio of beetroot seasoned with olive oil, beet puree worked with beet falls, mini beetroot and beet petal, accompanied by a porto sauce. 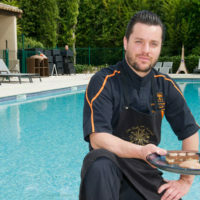 Basile Arnaud originates from our beautiful region of Cannes. 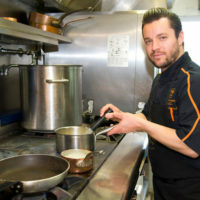 His passion comes from his “fin cordon bleu” grandmother with whom he loved to cook and from his father, a fishmonger he accompanied on the markets. 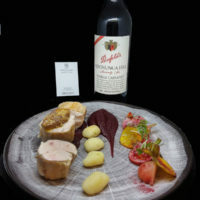 After Paul Augier High School in Nice, he honed his talents with talented chefs like Keith Podmore at the Boodle’s Club in London, who gave him his know-how to cut and cook large pieces of meat and fish, then served to crowned heads. 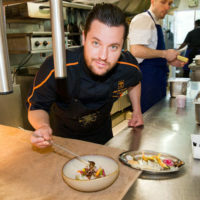 In 2008, his passion for beautiful flavors led him to discover Australia, Asia, Thailand, Singapore, Malaysia. 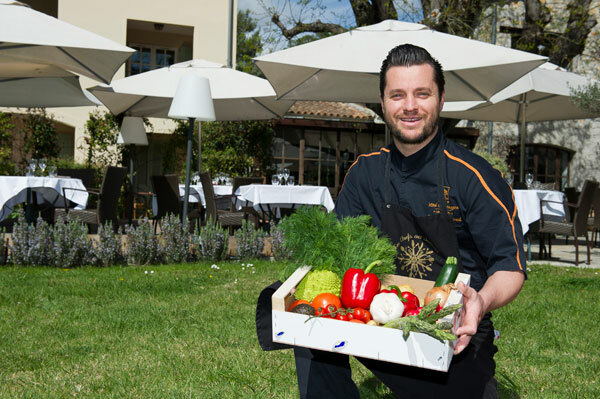 But his love of Provence and its beautiful products is stronger than the appeal of the sea and Basil decides to return to his native region. 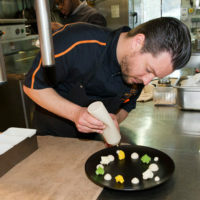 He then worked with Pierre Chambrin, Serge Gouloumès, David Chauvac and was Arnaud Tabarec’s second before taking over the kitchen of Le Jardin in 2016. 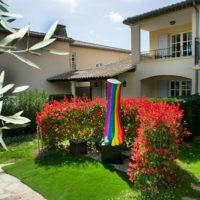 The Hotel de Mougins has 51 rooms and suites spread among four Provencal mas. 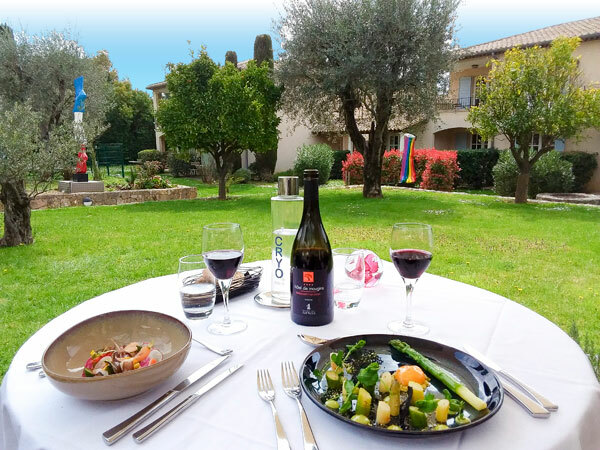 Provencal-style rooms are arranged like small cottages and feature a contemporary twist and all have a balcony-terrace or are at garden level. 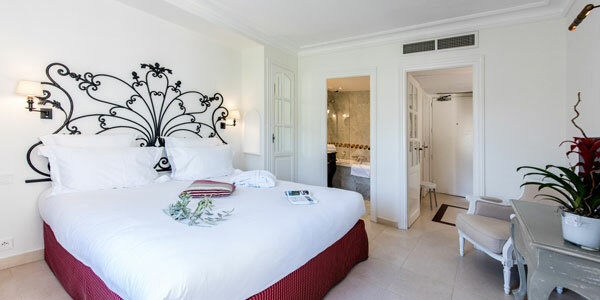 Ideally designed, the layout of the cottages allows guests to enjoy a quiet view of the park and the turquoise waters of the pool. 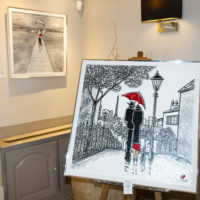 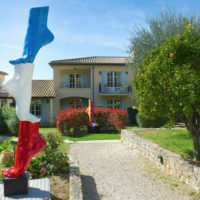 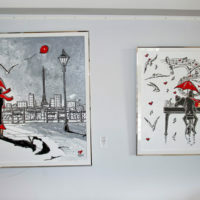 The Hotel de Mougins loves art and hosts temporary exhibitions by local artists such as Martins Lovers. 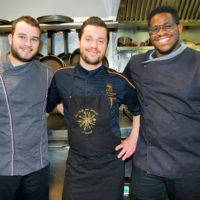 On Thursday, the Espace Lounge plays host to live music.